This entry was posted in Family History, Queensland and tagged marital longevity, Qld Pioneers by cassmob. Bookmark the permalink. you’ve prompted me to look at marital longevity in my ancestors Pauleen. I doubt I’ll find any 50 or 60 years like yours though. I hadn’t thought to look at it before but found it quite interesting myself. That’s interesting Anne…I only have one set who died close together, George and Julia Kunkel, both due to specific health reasons though no doubt grief played a role. I haven’t specifically looked at age of first marriage though the report I printed for,this included that info. Hi Pauleen, which program are you using to get the statistical reports? My mother-in-law’s parents died on 19 August and 11 September of the same year. It was a busy month for my parents-in-law as my father-in-law’s father died on 9 September but that was unrelated as he did not know his daughter-in-law’s family. My paternal grandmother’s parents died on 27 February and 8 March of the same year. His parents, my 2*great grandparents, died a few months apart, 17 August and 1 December of the same year. I forget if there are others. There are of course plenty of other couples where the survivor lived on. I used to use Relatively Yours – great program. I can’t get it to load on my new computer 😦 I still have the disks but I think it is no longer supported. As well as the statistics, I thought it was the best program for handling events, and events is what is key in our family history – I really liked the way you associated people with events and could associate people who were no on your tree also. Interesting thought Pauleen. If I look back at my Grandfather’s family. He died aged 66 years in 1974 and was the last of his brothers to die. He had five sisters – one died of a heart disease age 35 years, one died aged 83. The last three sisters were all into their 90’s. Their mother (Annie Prudence) born in 1879 died aged 92 and her mother (Caroline) born in 1844 died aged 91 years in 1935. Caroline’s mother (Prudence) was born in 1817 and died aged 37 years. By coincidence, forty years after the death of her father in 1974 my Mum passed away aged 66 the same as her Dad. I am now suitably inspired to look closer at this not just at the longevity aspect but also the coincidences. It’s weird how the genetics works isn’t it, with some dying young and others reaching old ages. I’ve got my head in the sand about the ones who died in their 60s…it’s not going to happen to me…I hope 🙂 Coincidences are interesting aren’t they? 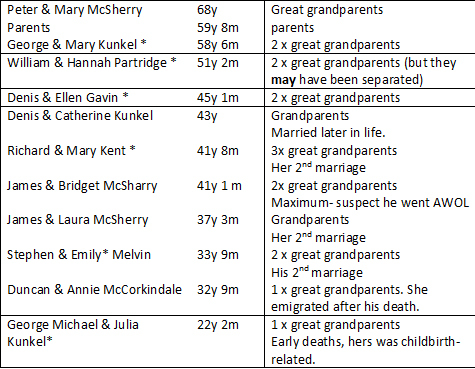 In terms of marriage – my Great Great Grandparents, (Caroline and Henry) who I mentioned above were married for 65 years. Henry died in 1929 and Caroline in 1935. I have a picture that was taken on their 60th wedding anniversary which was taken by my Great Aunt who was their Grand daughter. My Great Aunt could recall the picture being taken and described what they were wearing, the location and the weather! Caroline’s daughter Annie and her husband Charles (my Great Grandmother) were married 45 years with Charles passing away in 1943 and Annie in 1972. Whereas on my husband’s side there are lots of divorces. In fact Stuart is the produce of his parents second marriage (they were both married to other people previously). All his siblings are divorced and we are the only ones to still be rolling! So is it a case of luck, a case of divorce being easy now, although we have the divorce record of his Great Grandmother & father in 1922, or is there something else at play. It’s funny how our minds play tricks with us Elenor isn’t it? I guess the long-livers catch our attention more just because they’re around longer. Hi Pauleen, I always love a few statistics. It is interesting to look at our ancestors in different ways. I have some families groups with only a few children. It would be interested to know the reason eg separate bedrooms, partial separated (I have census records without and then with the husband again 10 years later), family fertility genes, or some children died early but I have not found the records yet. Nothing like a bit of number crunching Fran 🙂 Some must surely have resorted to separate rooms but that’s still not going to avoid those large families necessarily – unless you’re royal. The other thing you might consider is the Rh negative factor which played a much bigger role in our ancestor’s lives. If you find one or two children then no more it’s certainly worth considering. I had a genealogy friend, older than me, who worked on the team that identified the Rh- factor and my aunt lost several “blue babies” so I’m guessing it came from my maternal side.